May is International Brain Cancer Awareness Month, but what does that really mean? Do YOU know anything about Brain Cancer? Do YOU know what happens to a Child with Brain Cancer? Have you got ANY idea of what a Child with Brain Cancer experiences, or what their parents go through as they watch their offspring battle Brain Cancer? Children should be able to be children – to run around and play without care, and to learn as they grow, both at school and through learning via socialising, play and good parenting. When a child gets brain cancer, most of this goes out of the window, as the tumour grows and affects the areas of the brain that control speech, sight, balance, personality/emotions, language, understanding, and sensation. Brain tumours are the most common solid tumours in children, and what makes them so crippling is that the Child with Brain Cancer is not just physically affected, but also psychologically affected. 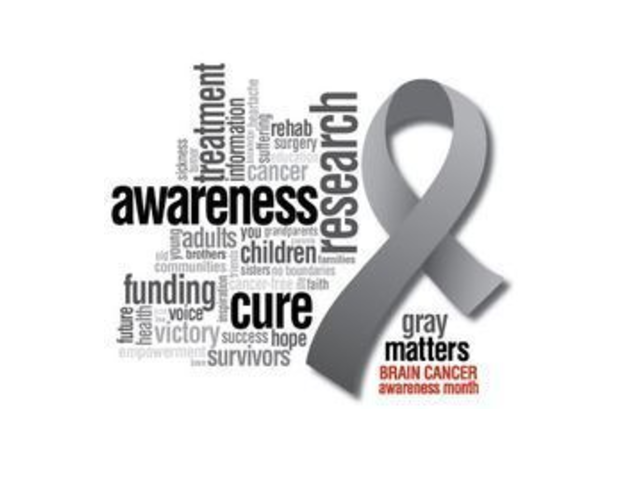 Brain Cancer causes cardiac problems, confusion, depression, diabetes, drowsiness, headache, hormone regulation, increased intracranial pressure (ICP), irritability, nausea, paralysis, personality changes, problems walking (ataxia), respiratory problems, seizures, slurred speech, lack of coordination, vision problems, vomiting, and can even cause the child to go into a coma. In the diagrams above, one can see the different parts of the brain and what they control (thought, memory, emotion, touch, motor skills, vision, respirations, temperature, hunger, and every process that regulates our body) – basically EVERYTHING!! Cerebrum (Supratentorial, or front of brain) – composed of the right and left hemispheres. Functions of the cerebrum include: initiation of movement, coordination of movement, temperature, touch, vision, hearing, judgment, reasoning, problem solving, emotions, and learning. Brainstem (Midline, or middle of brain) – includes the midbrain, the pons, and the medulla. Functions of this area include: movement of the eyes and mouth, relaying sensory messages (i.e., hot, pain, loud), hunger, respirations, consciousness, cardiac function, body temperature, involuntary muscle movements, sneezing, coughing, vomiting, and swallowing. Cerebellum (Infratentorial, or back of brain) – located at the back of the head, its function is to coordinate voluntary muscle movements and to maintain posture, balance, and equilibrium. Symptoms may vary, depending upon in which part of the brain the tumour is found. 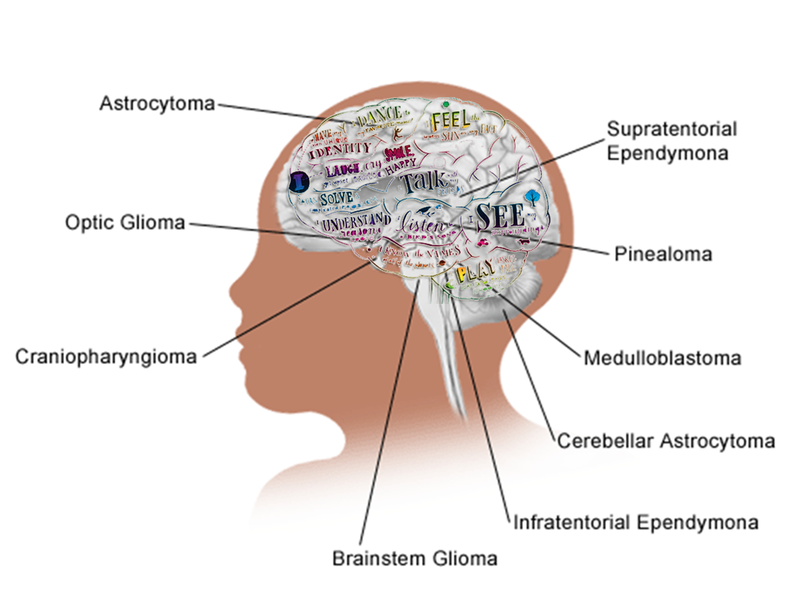 The most common types of Brain Tumours in Children are Brainstem Gliomas, Cerebellar Astrocytomas, Diffuse Intrinsic Pontine Gliomas (DPIG), Ependymomas, Medulloblastomas (also called Primitive Neuroectodermal Tumours, or PNETs). Brainstem Gliomas most commonly affect children between the ages of 5 and 10 years and make up approximately 10% to 15% of Childhood Brain Tumours. Brainstem Gliomas may cause sudden dramatic symptoms, such as double vision, clumsiness, difficulty swallowing, and weakness. Cerebellar Astrocytomas are benign glial tumours of the cerebellum. They are the second most common childhood tumour (15% to 20% of all paediatric tumours). They can occur at any time in childhood or adolescence and the symptoms are headaches, vomiting, or walking unsteadily. Sometimes there is pain at the back of the head. Diffuse Intrinsic Pontine Gliomas (DPIG) are brain tumours that occur in the brain stem, which controls breathing, heart rate and the nerves and muscles that help us breathe, see, hear, walk, talk control our bladders, and eat. Because these functions are vital to survival, the pressure from the growing tumour is very dangerous. DIPG primarily affects children between 5 and 7 years of age and about 10% to 20% of all childhood brain tumours are DIPG or brainstem gliomas. Ependymomas make up 8% to 10% of paediatric tumours and occur at any time during childhood. Ependymomas start in the ependymal cells that line the ventricles or central canal of the spinal cord. They are a type of glioma involving cells lining the cerebral ventricles and are not always distinguishable, on scans, from Medulloblastomas. They cause similar symptoms, and hydrocephalus (an abnormal condition in which cerebrospinal fluid collects in the ventricles of the brain; in infants it can cause abnormally rapid growth of the head and bulging fontanelles and a small face) often occurs. Medulloblastomas (PNETs) are the most common malignant brain tumour in children (20% of all paediatric tumours) and usually occur in children between the ages of 4 and 10 years. These tumours typically arise in the middle of the cerebellum, interfering with the flow of CSF and causing hydrocephalus. A child with a Medulloblastoma may get headaches, vomit, or walk unsteadily. Sometimes there is pain at the back of the head. Optic Gliomas are low-grade astrocytomas that start in the optic nerves (the nerves leading from the eyes to the brain). They are often linked with an inherited condition called neurofibromatosis type 1. These tumours are rarely fatal, but they may cause vision loss and injury to nearby brain tissue. PNETs that occur in the pineal gland are called Pineoblastomas. These tumours are usually harder to treat than medulloblastomas but have basically the same symptoms; headaches, vomiting, or walking unsteadily. Sometimes there is pain at the back of the head.